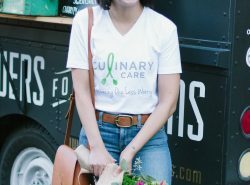 One of my favorite things about blogging is coming across fashion brands that give back to the community. Not only can someone look great when buying an item but they are also helping spread awareness and support an awesome organization. When 31 Bits reached out to me, I knew immediately I was going to like them just by their motto – Fashion For Good. 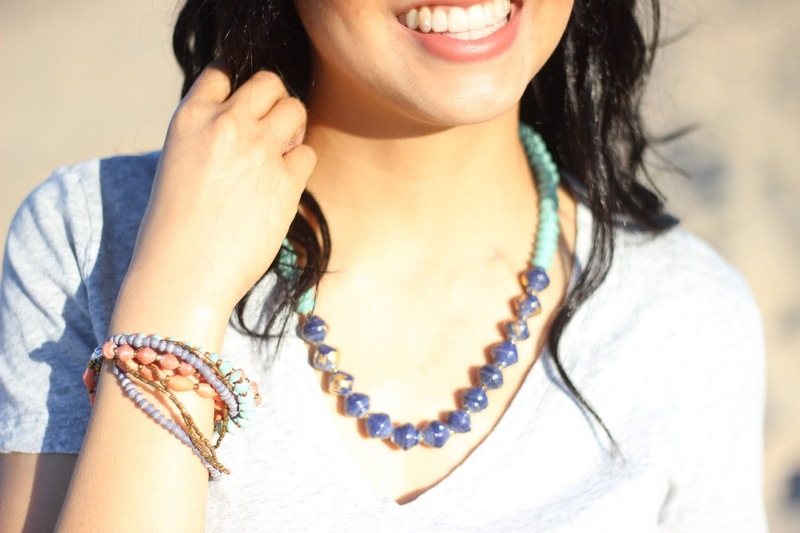 31 Bits’ have been empowering individuals through the fashion industry. They noticed that the women in Uganda lived in poverty and lacked education. However, they were very skilled and resourceful. They can create beautiful jewelry out of recycled products. The founders partnered with the ladies of Uganda to create fashionable jewelry. Through this, they are able to have an income that can help support their families. 31 Bits is able to fund & support these women through the product sales. This means any time someone makes a purchase, it directly impacts the women of Uganda! Basically, you can get a cute piece of jewelry and one of these women is able to support their family financially. It is a win-win situation. I love how this organization is empowering these women! Plus, the jewelry pieces are super cute! Love what I am wearing? Well I am wearing the Bayside Bundle bracelet and Starry Eve necklace. But how cute is this necklace?! I totally would love to pair it with this maxi dress. Talk about a statement! I highly suggest checking out the rest of the collection. It won’t disappoint and it helps these women have access to financial sustainability, physical & mental wellness, social support, and community impact. That is a great motto. Sounds like such a cool organization, and I love your pieces. I love that motto and I knew of 31 bits when it first started but I lost track of it so it's nice to see it again! Thanks Alissa! That's so awesome you knew about them in the beginning! What a great organization and love their pieces! Looking gorgeous by the beach Rach. I love the whole relaxed look. Such cute sandals. 31 bits sounds great! I love fashion brands that give back! You're able to buy something cute and help others at the same time. Win win. These pieces are very pretty! Love this! I love supporting brands too that spread a good message or is for a good cause! The fact that this brand uses recycled products to make this incredible jewelry is so awesome! Great post, and you're too cute! Thank you Vanessa! I love it when they give back! It really is a win situation! Love 31 bits! Such a great cause and beautiful pieces! I am also loving your linen pants! Aren't they awesome?! Thanks Amy! Love this easy and comfortable look! Gorgeous! Sounds like a great organization and great cause ! It really does! Thanks Heidi! 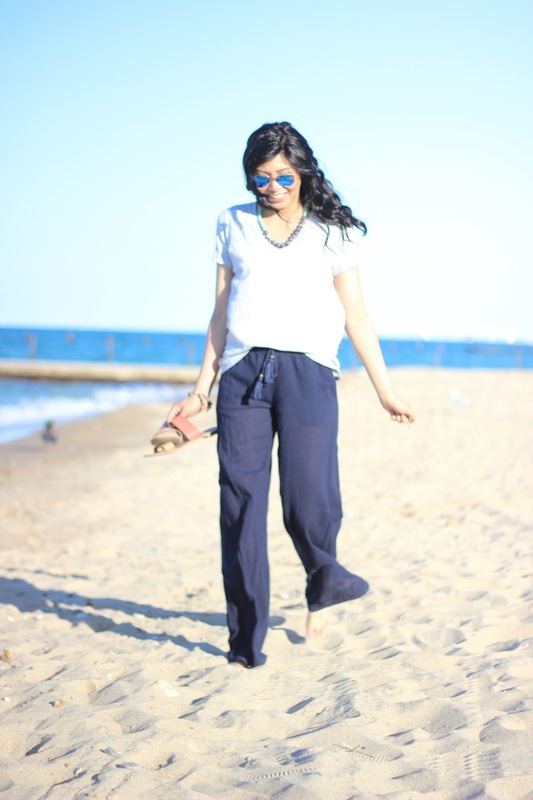 Those pants look so comfy for a beach day! Thanks for letting me know. I'll check them out! I LOVE brands that give back or are ethical and socially conscious. 31 bits sounds so great and I'm hopping over to their site to check them out now! Me too! Let me know what you think! It looks like you picked out some really gorgeous pieces. That necklace is amazing, and even better that they give back! Couldn't agree more about wearing brands that stand for a good purpose! Those jewelry pieces are so pretty, and I love the beach theme! Right?! It really is a win situation for everyone! Uganda is literally my neighboring country back here in Africa and this touches my heart. The jewellery is amazing and am happy that you collaborated with them. I love the outfit, it is perfect for a walk in the beach. OH my! Well then I am glad I can bring awareness! Thanks Meron! Hi Rach, I am also a Rach haha! loved this post. A brand that I will definitely have to check out, I love what they stand for too. Haha nice to meet you Rach! Thanks for the sweet compliment! Love your outfit!! You looks so great dear! I love your look! Those sandals are gorgeous. 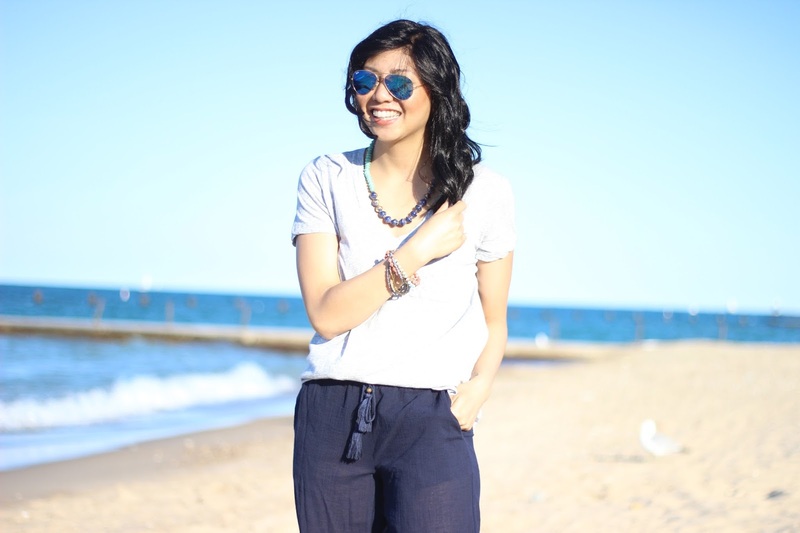 Love the beachy easy breezy look of this outfit Rach! Fashion for a cause is such a win/win. 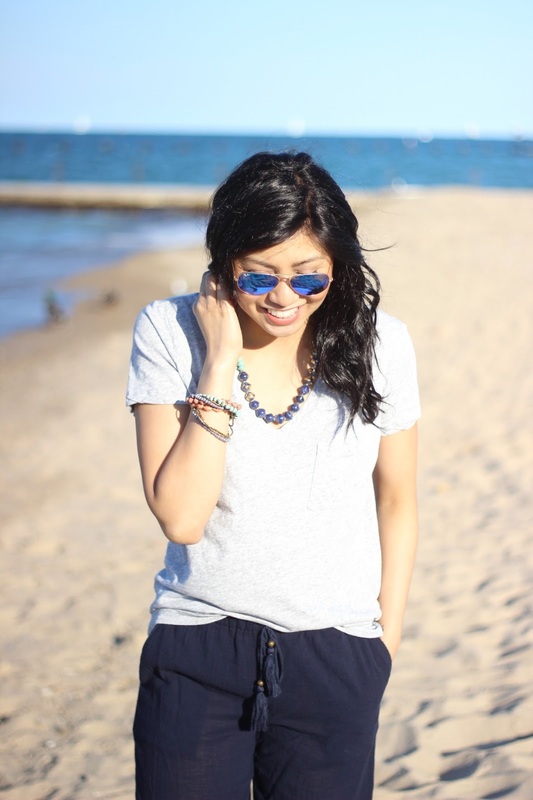 Love the 31 Bits pieces- and the whole outfit is beach-chic perfect! Isn't it the greatest?! Hope you like it as much I do! Just strolled across your blog! Love the images babe! I completely agree! I love finding brands that give back in some way. These pieces are beautiful! I will have to look into this company. Thanks Bryn! It really is a win! Love this comfy beachy look! Have fun this Summer! Loving this casual look babe!! You look beautiful! This beach outfit is so cute, you look so comfortable and fresh! I love brands who stand behind a good cause too. Love your stack of bracelets, and these photos are so lovely on the beach. Thanks Mahryska! It really is! What an amazing brand! Fashion that does good is one of my favorite things! I love that you are promoting ethical fashion that is also so beautiful! 🙂 Thanks for sharing! It's one of my favorites too! Thanks Annie! I love 31 Bits! They make such beautiful jewelry and knowing that they're helping people in need always makes me feel good about supporting their company! You look fantastic!